Tech N9ne sat down with Lawrence.com‘s Richard Gintowt for a podcast interview and covers his experiences thus far in the Year of the N9ne–from finishing up his latest tour with the Rock the Bells independent hip hop festival to future projects in the works. Tech even explains some of the motives behind his latest album, K.O.D. Tech also chats about his recent trip to Europe (“Amsterdam is a ‘Tech N9ne Town”) and his plans to be known in the ranks of Lil Wayne, T-Pain, The Game, Jay-Z, and Twista. Tech talks about the inspiration for some of the songs from the K.O.D. album, gives a few clues what to expect from the K.O.D. 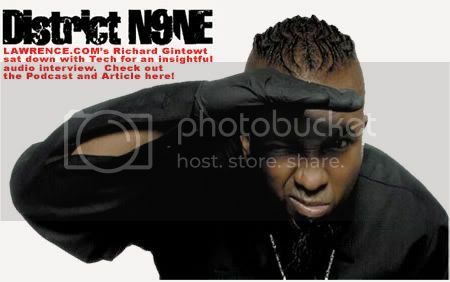 Tour, and closes with “I’ll never do a totally dark album again.” With all the success Tech N9ne has enjoyed in his career, he lets it be known that “this is not it, yet.” Click here to read the entire article and listen to the podcast.